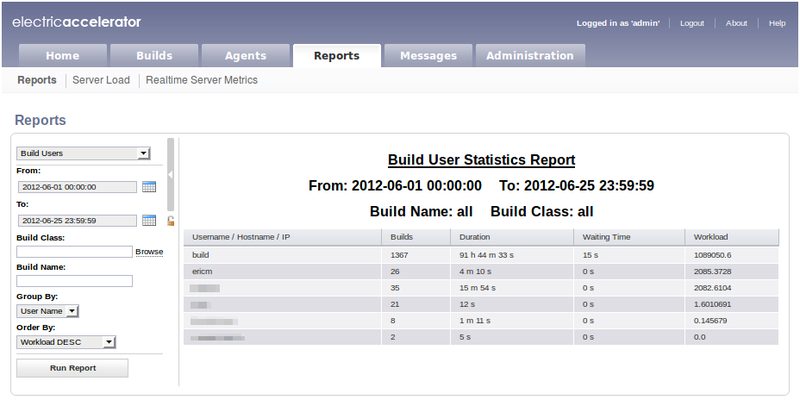 Example build users report. Click to view full size. In data centers it’s not uncommon to find servers configured with two network interfaces: for example, a gigabit connection for communication with systems outside the data center, and a 10 GigE, fiber-optic or Infiniband connection for extremely high-bandwidth communication with other systems inside the data center. Accelerator 6.1 adds explicit support for this configuration, so data transfers between agents in the cluster utilize the high-bandwidth secondary interface for increased performance. For years Accelerator has relied on the checksum built into the TCP standard to ensure integrity of network data transfers. Unfortunately that checksum is relatively weak, and in rare cases we found it was insufficient to detect data errors introduced by faulty network hardware. In this release, we added an application-layer checksum to further guard against such problems. Accelerator 6.1 uses CRC32-c, chosen for its robust error detection capabilities and high performance. It feels great to have wrapped up Accelerator 6.1, but we’re not resting on our laurels. We’ve already done a lot of work for 6.2, which includes some key robustness improvements that have been literally years in the making; and we’re getting started on 7.0, which currently is planned to include some really exciting new performance enhancements around incremental builds — more on that soon. Accelerator 6.1 is available immediately for current customers. New customers should contact sales@electric-cloud.com.